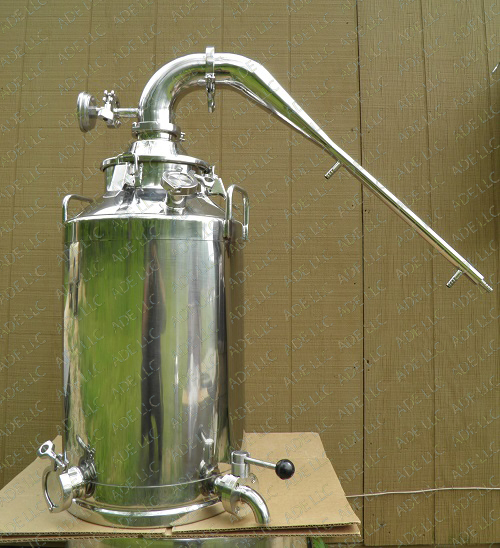 5 Gallon Moonshine Still Boiler, Much Thicker Stainless Steel than China Stills! If you are looking for a moonshine still you have found the right place. We have moonshine stills of all types and sizes. 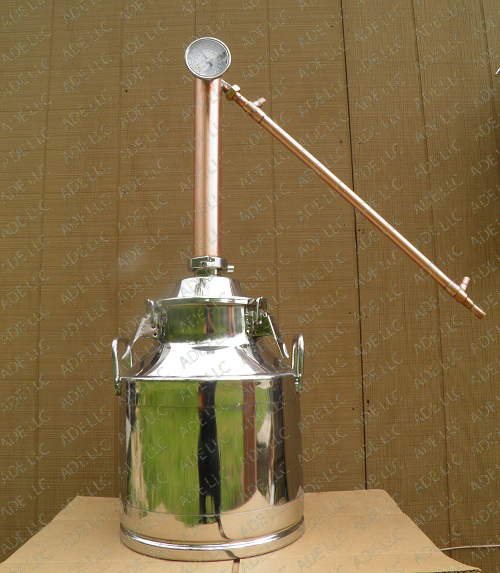 We have moonshine stills in sizes ranging from 5 gallons to 55 gallons. We have any type of moonshine still that you want including reflux column moonshine stills for e-85 and vodka , pot still moonshines stills for whiskey, Bourbon, Rum and Brandy, perf, plate column moonshine stills and bubble plate column moonshine stills. 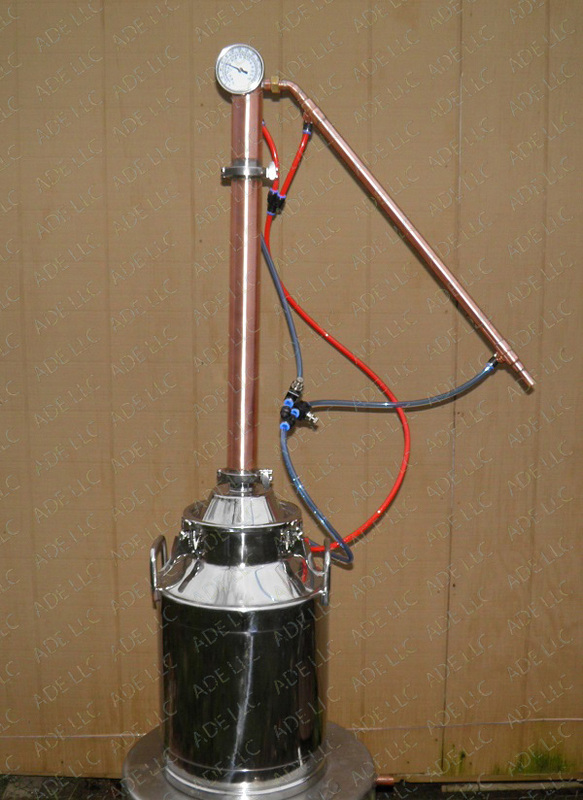 We have electric moonshine stills, propane moonshine stills and we even have baine marie moonshine stills. A baine marie moonshine still has a jacket filled with cooking oil. There are electric heating elements in the jacket. This indirect heat allows you to have solids in your mash without the worry of scorching. A direct fire moonshine still can only run mashes that are all liquid. If you put a grain in mash in a direct fire moonshine still it will scorch. All of the best Bourbons and whiskeys are distilled from thick corn mashes with the grain left in. If you use the cook corn method with no sugar and run the mash in an indirect fired moonshine still you will have a much better product. You can cook the mash in the jacketed moonshine still before you ferment it. Grain in mashes that have no added sugar must be cooked and a little malted barley must be added to turn all of the starch in the grain into sugar. This is how the real Moonshiners did it before cheap sugar came along. Our Jacketed moonshine still will allow you to do this. We supply a book with our jacketed baine marie moonshine stills that gives complete grain in recipes and mashing instructions. Please see all of our great moonshine stills listed on the left. Just click on a blue link to the left to see the moonshine still of your choice. The Moonshine still below is one of our 5 gallon pot stills with a copper column. The copper column has a built in condenser. This little moonshine still will make some great whiskey, bourbon, brandy and schnapps. The Moonshine still below is one of our 13 gallon pot stills with a stainless pot still head. The stainless head has a built in condenser. This moonshine still will make some great whiskey, bourbon, brandy and schnapps. The column comes packed with copper. 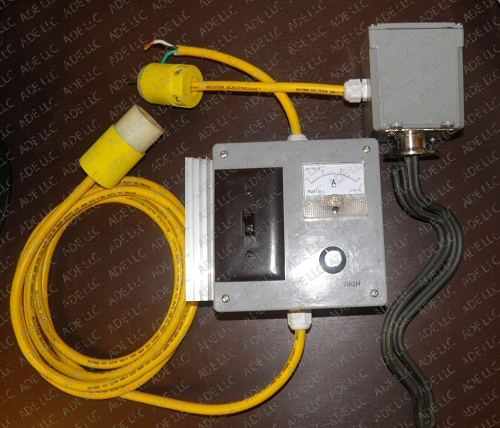 below is an electric heating system with controller that will work for our 5 gallon to 13 gallon moonshine stills. The moonshine still to the right has a 53 gallon capacity and it has a 4 plate copper bubble plate column. The column is modular and can be used as a Pot still column. This column breaks down and reassemble quickly for easy cleaning.